Yesterday I read like four books, so today I decided that instead of reading, I would spend the day in the kitchen. 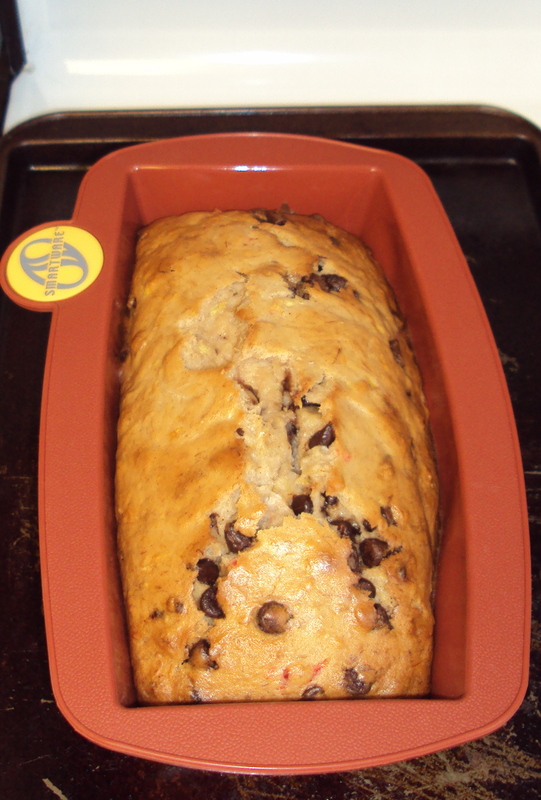 I’m not sure why exactly, but I have been craving banana bread for a while now. First, I had to go to the store (in my pjs of course) and ran into some girl scouts selling cookies. Yippee!!! I secured two boxes of delicious cookies (I still have 3 boxes on the way) to give me something to munch on while cooking. I started with deviled eggs. Why you ask? My boss recently gave me a whole bunch of eggs and I had no idea what to do with them. 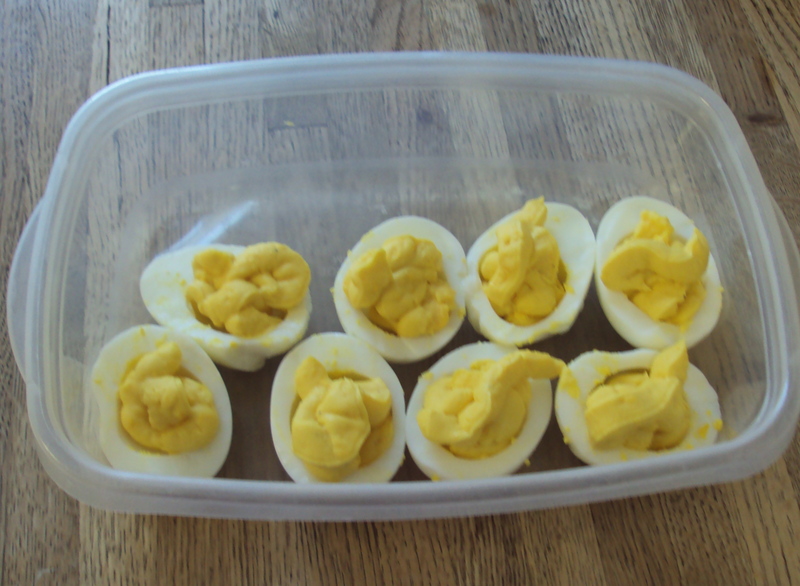 I found a recipe for deviled eggs and problem solved! 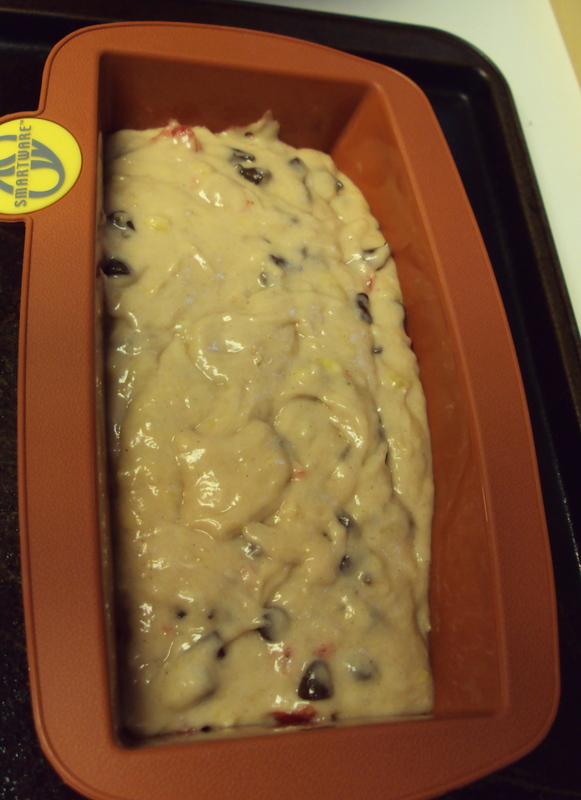 They look completely disgusting….almost like something that came out of one of my cats, but they taste so great! I have already eaten 1/4 of the loaf and I’m sure that I am not finished yet for the evening. I think I am pretty set for the rest of the week with my homemade bread, girl scout cookies, and leftover eggs. I wonder how long deviled eggs can be refridgerated? After doing all the dishes from this afternoon, I probably won’t be doing any cooking/baking for a long time. I am actually a big football fan myself, but this year I did not watch one minute of the Super Bowl. I have a deep, burning hatred of the Pittsburgh Steelers, so I was pretty sure that watching the game would be too painful. Apparently I missed a really great game (GO PACKERS! ), Xtina messing up the anthem, and a sub par halftime show. But I don’t care that I missed it because I was having a wonderful girls’ day with my mom. First, we went to see The King’s Speech, which is very, very good. Colin Firth is unbelievably awesome as Bertie (or King George VI) and Helena Bonham Carter is phenomenal as his wife Elizabeth. We both enjoyed the movie and shed a few tears at the end. Then we went to Steak and Shake and I had a very yummy grilled cheese sandwich, fries, and a Butterfinger shake. I’m pretty sure that would be my last meal request if I was ever on death row (I know I can’t be the only one who has ever thought about that). But the best part of the whole day happened while we were watching the BBC Sally Hawkins version of Persuasion. During the movie, we made Chocolate Chip Oreo Cookie Sandwiches. That’s right, you read that correctly. 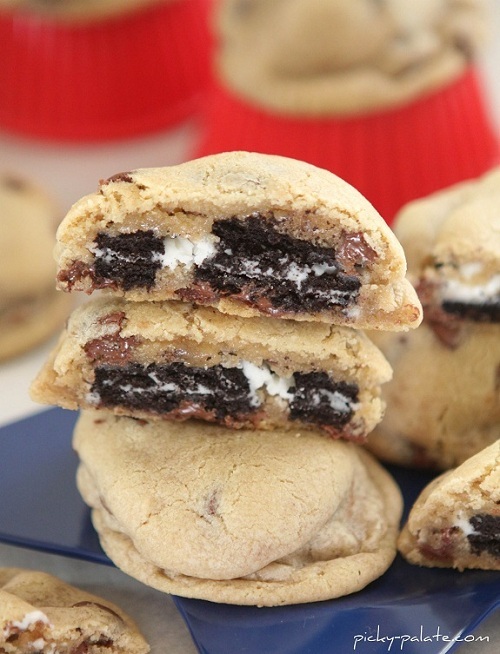 It is basically an oreo inside a chocolate chip cookie. Here is a picture that is totally drool-worthy. I found the recipe on the blog The Picky Palate, which has an overabundance of fun cookie recipes to try. Needless to say, the cookies turned out amazing and they are HUGE! They are like little mountains of chocolate-y Oreo goodness. They are perfect after being warmed in the microwave for about 20 seconds and served with 2 glasses of milk (you will literally need two). The only downfall of the recipe is that it only makes about 24 cookies. With my mom taking home half of them to share with my dad and sis, that did not leave a whole lot for me. I am currently rationing them so I only eat one cookie a day. Hopefully that will allow me to hold out until I go home in two weeks and we can make them again. I think next time we will try to use mint Oreos and mint chocolate chips. Or maybe peanut butter Oreos and peanut butter chips. The possibilities are endless! To get the recipe for these awesome cookies, go to The Picky Palate. Happy baking! 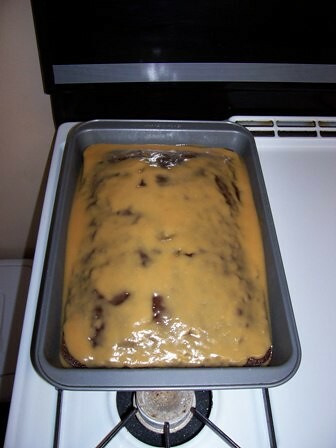 Ever since I watched the tv show about the Harry Potter cake, I have had this nonstop craving for cake……..I daydreamed about it all day at work on Friday and last night I literally dreamed about it………when I woke up this morning I knew what I had to do……….. I went to the store and bought a chocolate cake mix (I could have made one from scratch, but I don’t have enough patience for that). I also had to buy a mixer because I was too lazy to try to stir it by hand. Well, the cake itself turned out lovely and chocolatey and not burned at all (which in my oven is something to be said), however there was one little hiccup………..when I went to make the frosting I realized that I don’t have any powdered sugar………….now most people would just look for a recipe without powdered sugar in it, but oh no, not me………….I decided to just throw a bunch of things together and call it good. I thought I would be creative and add some peanut butter so that is why it is that color………the main reason I did that was because it was just too liquidy to spread……..I haven’t tried it yet, because I have been letting the frosting “set.” It’s gonna be pretty sad if I spent my whole Sunday afternoon working on this only to have it taste like rubbish………I’m off to have a piece now, so we will see how it goes. EDIT: The cake was fabulous!!!! Unfortunately I don’t remember exactly what I threw in the frosting, so recreating it could be a problem. Another problem is that my carbon monoxide detector started going off………now I’ve got my sliding door all the way open and my fan going at top speed. ugh.